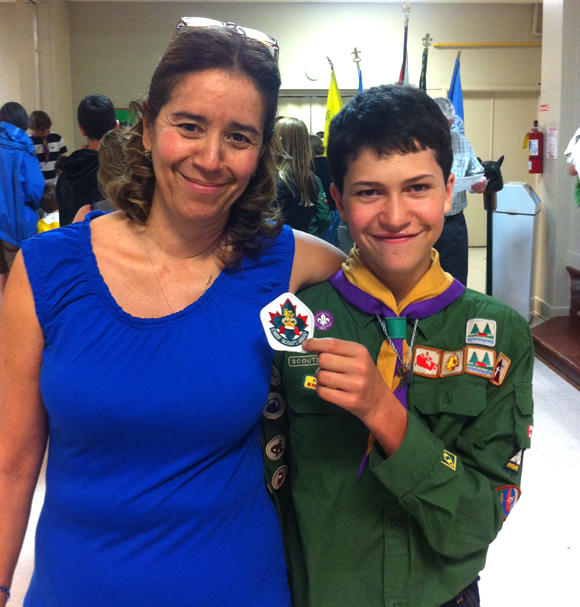 Jose Antonio Ramos Mendoza of the 32nd St. Matthius Scout group and his mother Rita Mendoza. Photo by Mimi Golding. Hintonburg resident Jose Antonio Ramos Mendoza – or, as he’s known to his friends and fellow scouts, Tonito – is the first scout in Ottawa’s 32nd St. Matthius group to receive the Chief’s Scout Award. The Chief Scout’s Award is the highest award that can be achieved at the Scout level in Scouts Canada. “It’s probably been thirty or forty years since the award has been issued to anyone,” says Mendoza’s Lead Scouter, Steve Fischer. The award is the accumulation of three years of hard work, but it was an undertaking that came naturally to the young scout. Earning the badge required Mendoza, 14, to excel at a number of skills, exercise leadership, and commit himself to volunteer work within the community. He researched and learned about different levels of government, aided Fischer in organizing Scout camps, and helped his fellow scouts work to get their knife permits, among other tasks. Working towards the award has not only been about giving back to the community, but also receiving its support. Family friends, Mimi Golding and her husband Tim, took Mendoza under their wing and helped with all the “onerous requirements outside of Scout Headquarters,” Fischer adds. Despite all his hard work and dedication, the new Chief’s Scout Award winner isn’t all serious. “He’s a totally fun guy. Kids would always want to be in his tent or in his van. He’s kind of a quiet guy around adults, but with kids he can spin a yarn like nobody else,” says Fischer. Mendoza will be advancing to the Venturer Scouts program, where he’ll be able to exercise the leadership skills he’s learned over the past years and have more of a say in organizing different activities.